Well First Up we have an anime titled Aho-Girl available for streaming On Crunchyroll. hmmmm Were to start on this thing. 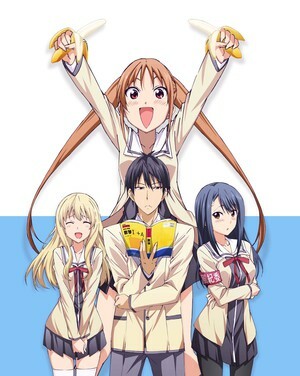 Well If you enjoy straight up episodic comedy where you need to just turn your brain off ( much like the main character of this series ) and just sit back and watch, then Aho-Girl may be for you. But be forewarned the fan-service is strong with this one!!!!!!!! Aho-Girl follows our two leads, Yoshiko Hanabatake who is the IQ of a flee, no I.m sorry that is an insult to flees everywhere, no serious the girl is a pure idiot! Anyway it Follows Yoshiko and her childhood friend/romantic interest Akuru Akutsu or A-Kun who has the unenviable task of looking after Yoshiko. The setting as you can likely guess from the above picture is I believe it is highschool but It could be middleschool, but that's beside the point. What is the point is that this show while funny at times can be hard to watch because of the pure idiocy of Yoshiko! Oh and did I mention the Fan-service? Don't get me wrong I enjoy fan-service in my anime but god is it over used and blatantly shoved in your face in this show! I am currently on the fence about weather I will continue watching or if I will be dropping this series. Only time will tell, fortunately the show only has an episode run time of about 12 minutes which usually I hate but in this case I am not sure I could take the show in larger doses. QUESTION: The Area of exposed skin between the hem of a miniskirt and the tops of knee-high socks is known by what name? 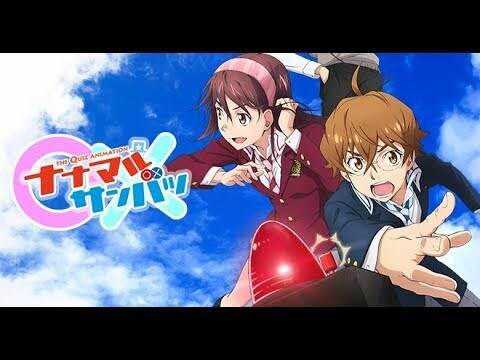 If you knew the answer to that question apparently you are an Otaku, or at least you are according to the Anime "Fastest Finger First"
Who would have thought that an anime about a high school competitive quiz club would be entertaining? I certainly didn't until I watched this show! Be quick on the buzzer though or you might miss out on the fun. In this show we follow bookworm Koshiyama as he gets pressured into joining the schools quiz club by his attractive yet trivia obsessed classmate Mari. It's a pretty straight forward show with potential. 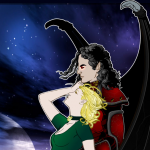 I am liking it so far and I can see a potential romance forming between or two lead characters, it all depends on how the show wants to take them, but the chemistry is there for it to happen. I will certainly be keeping this one in my queue for the time being. Clean Freak Aoyama Kun is a Sports anime, I HATE SPORTS ANIME! but not this one. The reason I like this particular sports anime is that while yes it does feature Soccer ( Football for you non-Americans out there ) it isn't the real focus of the show. No the real focus is on our lead Aoyama who is a SUPER germophobe!! While a true deus ex machina in terms of skill on the soccer field his need for cleanliness and his obsessive compulsive need to clean is what truly makes his a fun anime to watch. I get a real kick out of his interaction with his teammates about his clean freak nature especially the team captain that is obsessed with winning and is a soccer purist who often finds Aoyama need to stay pristine clean on even in the middle of a game frustrating . His aversion to filth can be a true hindrance on the field but there is one thing he hates more then dirt, and that's losing which of course leads to more of the aforementioned deus ex machina like skill! If I was watching it for the soccer that would be a turn off and I would drop this show quickly, but since I am watching it for the humor it doesn't bother me in the least. Lastly for today I give you Restaurant To Another World! This is one of the three anime I was looking forward to this season and I have to say I am disappointed! 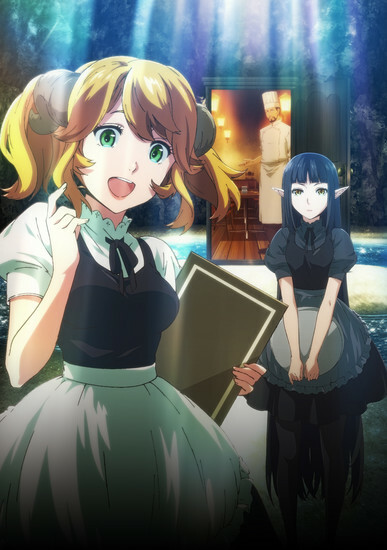 It is nothing at all like I thought it would be, Don't get me wrong I still think it is an okay Anime and will continue to watch it but as I said it isn't what I though it would be. This show takes place in a regular everyday Japanese Restaurant that severs western cuisine. The quirk is that there is a magical door in the place that once every seven days connect to several different locations on a fantasy world where the denizens of the world come to the Restaurant to eat food like they never experience on their own world. No I pictured this as a comedy where you would have all these rowdy Youki, monsters, and oni rubbing shoulders and getting into arguments while chowing down on sushi and udon but what we get instead is a serious episodic show that focuses more on the customers of the restaurant which are mainly ( thus fair ) regular humans from this other world, though some monsters races have popped up. Each episode features a short tale about one of the customers that find their way through the magic door into our world for dinner! It is interesting enough for me to continue watching it, but now but not so much so that I'd be upset over it if I suddenly couldn't watch anymore of it. And there you have it for another edition of Anime talk. Let me know what you think of these Anime in the comments below and tell us all what you are currently watching or looking forward to watching!